The beauty and charm of the wilderness are his for the asking, for the edges of the wilderness lie close beside the beaten roads of the present travel. There is never enough time. Though the days are incredibly long, I still feel the pressure to move, to see more, to drive to another spot in hopes of seeing something spectacular for my group. And, of course, they must see the prime attractions of the park – Old Faithful, the Grand Canyon of the Yellowstone, the incredible thermal features. But those areas can be so crowded, so hectic. That is one of the reasons I love the northern section of the park so much…the expansive views and smaller crowds, plus the incredible wildlife, make it easier to feel connected to the park and a to gain a sense of getting away from it all. This is also true as you pass out the northeast entrance of the park and head out along the Beartooth Highway, considered by many to be America’s most scenic roadway. I had originally planned a trip to the Beartooths on the last full day of our trip, but a variety of factors caused me to move up that plan and we headed north a few days early. 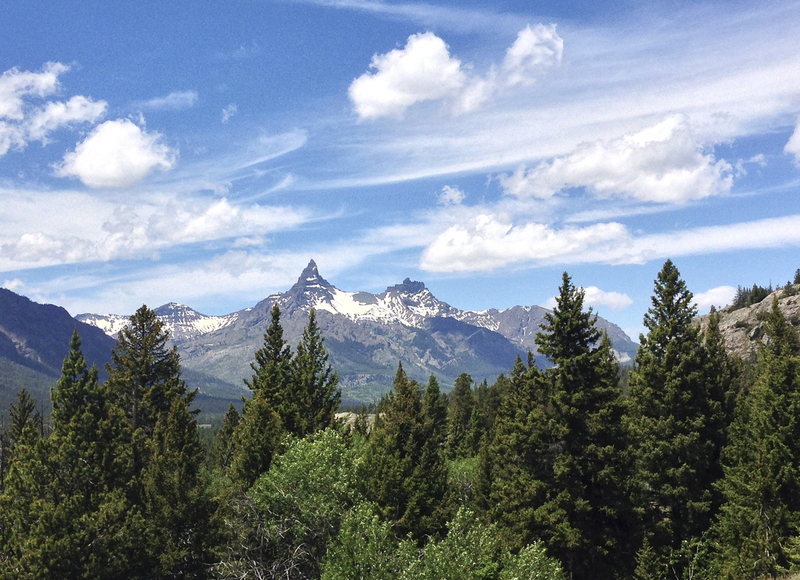 A quick stop for lunch at a scenic pullout gave us time to admire the view, taking in two prominent glacial-carved peaks – Pilot and Index. As we gained elevation we passed the beautiful aquatic mirror known as Beartooth Lake. But as we climbed higher, I could see the top of the mountain was shrouded in clouds. Hoping it would clear, we kept driving. 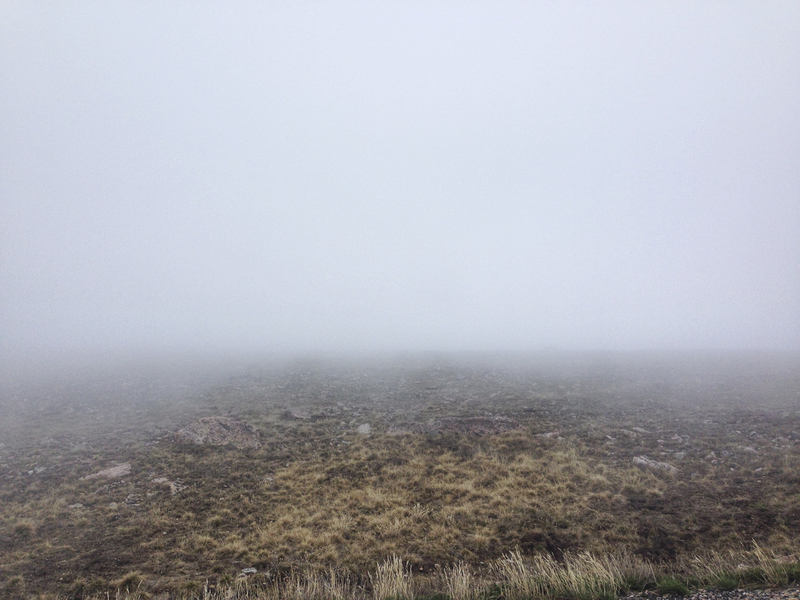 But it only got thicker and more gray, to the point where we could see only a few feet in any direction, not the glorious vistas or wildlife viewing I had hoped for. We turned around near the top and returned to Silver Gate. A couple of days later, we joined my friend, Dan Hartman, for a short hike starting part way up the road toward the Beartooths. One of his favorite wildlife areas is an aspen grove near the road that has many species of nesting birds. 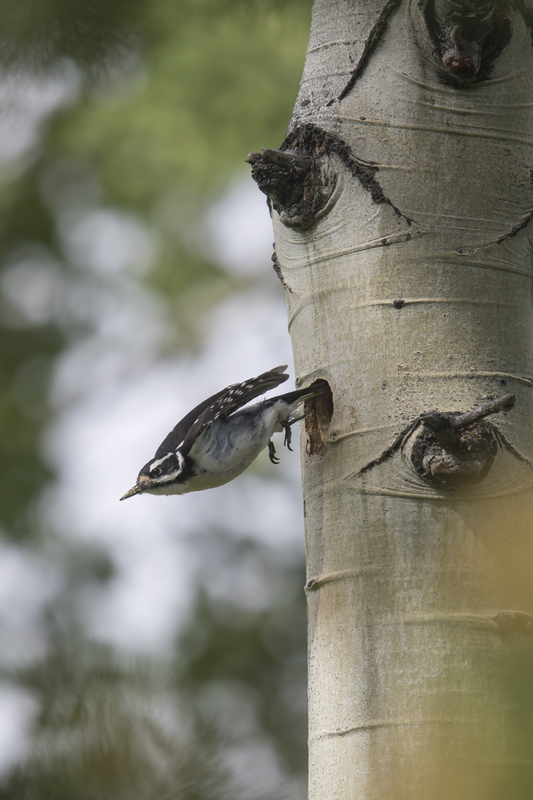 Quaking Aspen are not only beautiful trees, they also provide excellent habitat for cavity-nesting birds. After spending just a few minutes in this grove, we had spotted the nests of several species including Hairy Woodpecker, Northern Flicker, Red-naped Sapsucker, House Wren, and Mountain Bluebird. Although I could have spent several hours in this productive area, I decided to head back up to the Beartooths since we were part-way there and my group had not yet seen the top of the mountain. Dan agreed to go with us, so we headed up the highway following his car. We had barely gone 100 yards when he stopped, pulling off the highway, and jumping out of the car with his camera. 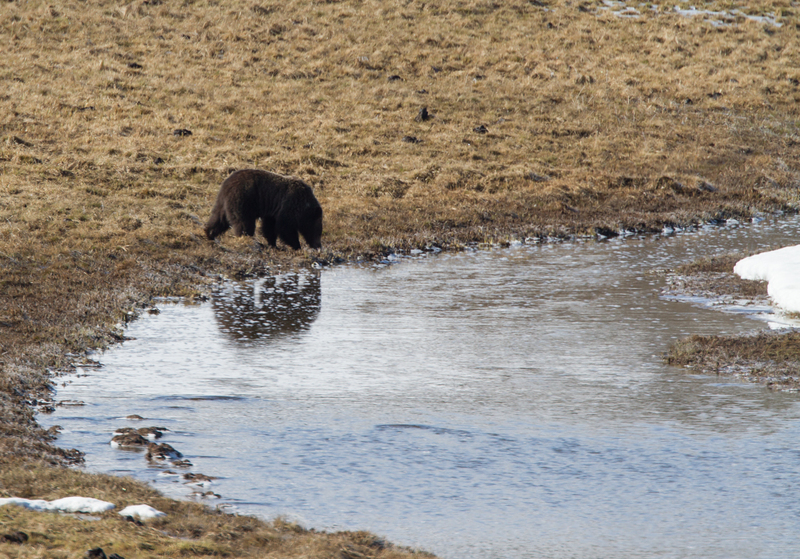 As I pulled up I was stunned to see two young grizzlies down over the bank. I grabbed my camera, which still had my telephoto on it from the aspen grove, and jumped out next to my car. We all took photos of the bears, heads down, actively feeding. Another car pulled up and both bears paused momentarily and looked their way. 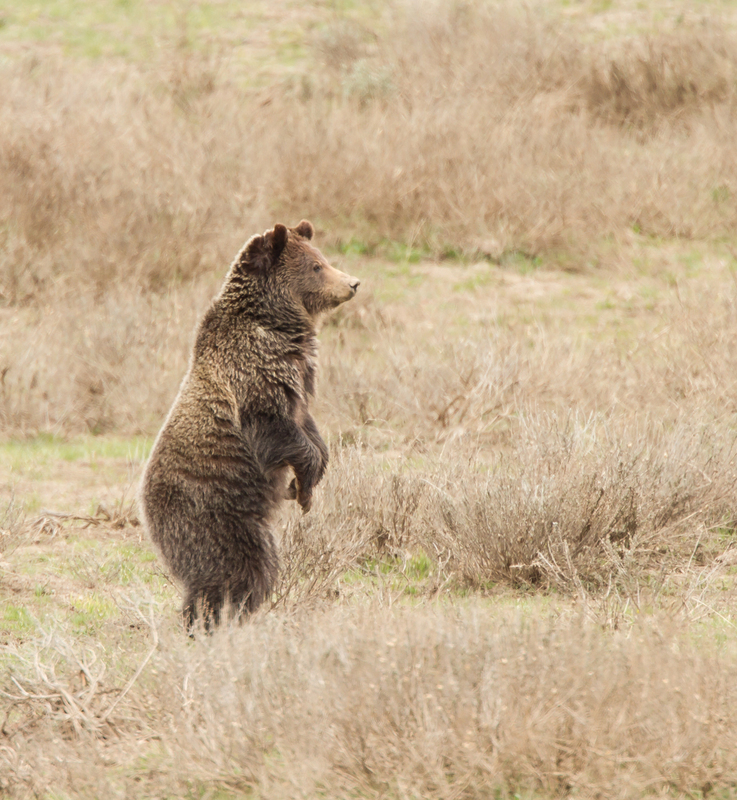 As I watched the bears I noticed they were mainly feeding on one of the more common roadside plants – Dandelions. Looking at the photos back home, almost every bear bite captured by my camera was a Dandelion flower or leaf. The only other food item I detected was some Horsetail, another common plant common along the roadside. These bears are probably siblings, most likely 3-year-olds, out on their own for their first season (grizzly young stay with their mother for two years). They seemed focused on feeding and basically ignored us except when another car would drive up. Being outside the park, there was not much traffic, but when a few guys on motorcycles stopped with the engines chugging, both bears took notice and stood up to check out the noisy interlopers. Finally, we decided to move on as the bears decided to ease back into the treeline, making them almost impossible to see from the road. Climbing higher up the mountain we could see the changing landscape as trees dropped out and snow still covered large patches of the rocky terrain. The high elevation views are also interesting if you glance downward. Here and there at these heights you may find an anomaly known as watermelon snow. 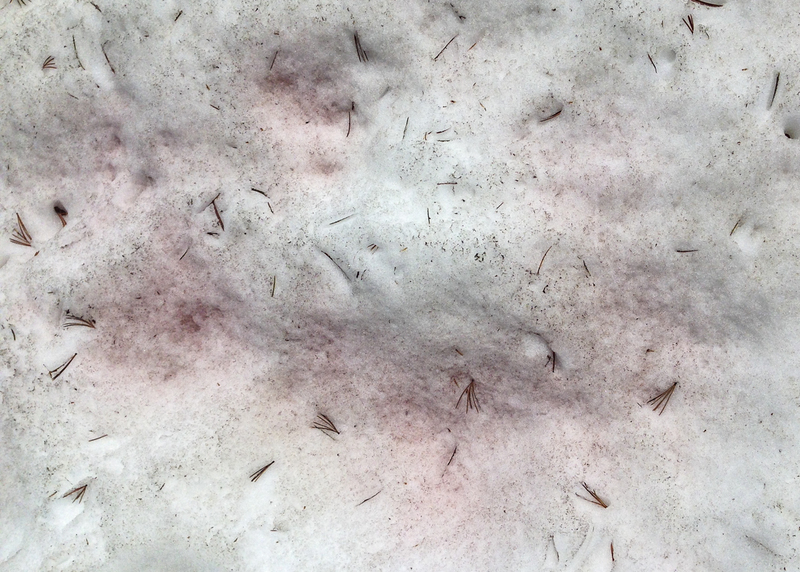 This pink snow is caused by a cold-loving algae that has a secondary red pigment in addition to chlorophyll. The red pigment probably plays a role in protecting the algal cells from the intense sunlight at these altitudes. It may also absorb heat and hasten the melting of the snow around the cells. The roadway gets up over 10,000 feet above sea level as you go over the pass. Gusty winds are a common companion at these heights and I always marvel at the group of animals that make this landscape their home including Yellow-bellied Marmots, Pika, Rosy Finches, and the non-native Rocky Mountain Goats. We stopped to view a band of several Rocky Mountain Goats grazing on the alpine vegetation on the wind-swept slopes. They gradually worked their way over the hill, vanishing from view. 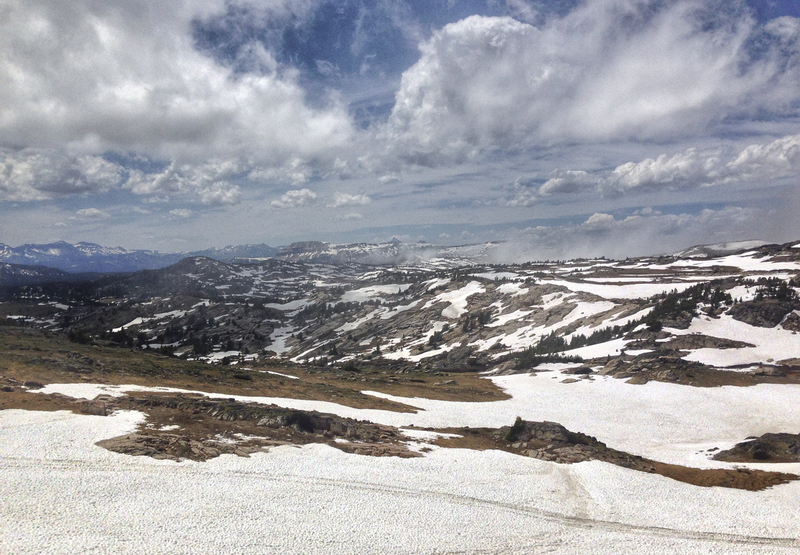 If you are ever in this part of the Yellowstone region, I highly recommend a side trip up the Beartooth Highway. I always feel as if I am in a totaly different world, a world of sky, snow, rock, and animals adapted to extremes. And it is a place where feeling the wind in your face and simply taking a breath can make you feel so vibrant. 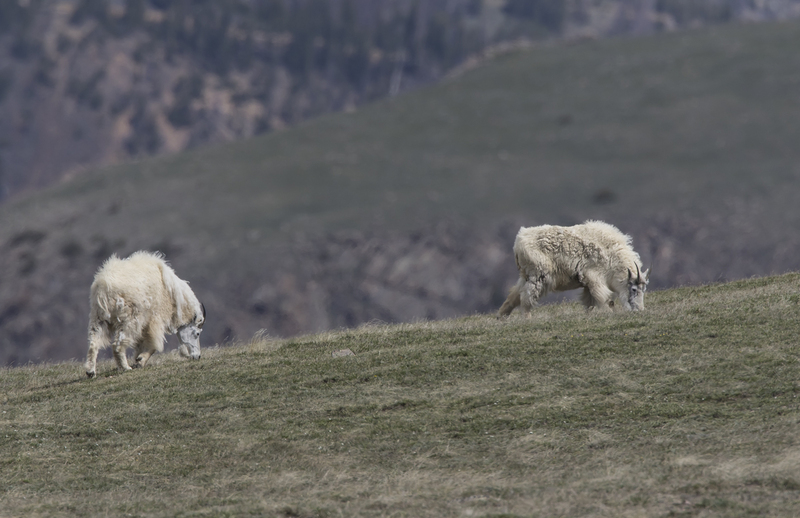 It is a wonderful tonic…perhaps we can learn something from Rocky Mountain Goats and Pikas. Muir was probably not far off in that observation. 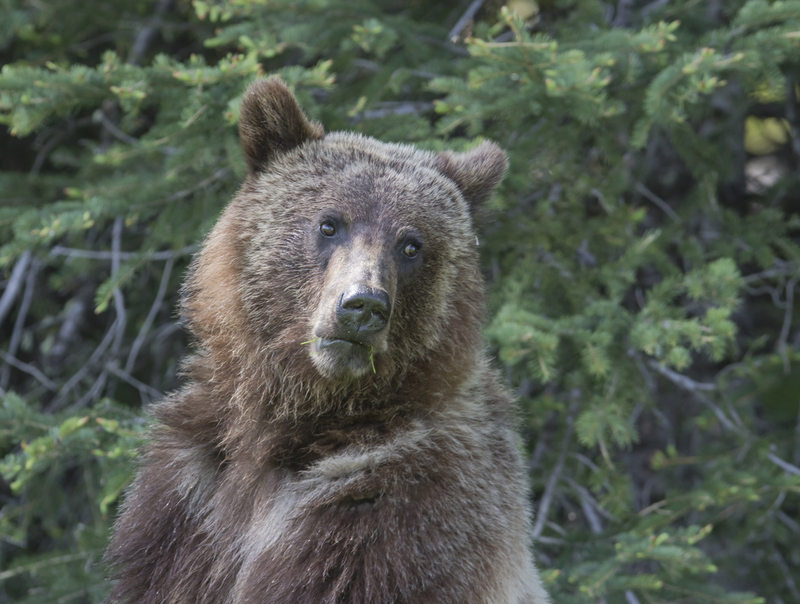 Grizzlies (and Black Bears as well) have a tremendously varied diet according to the season and food availability. 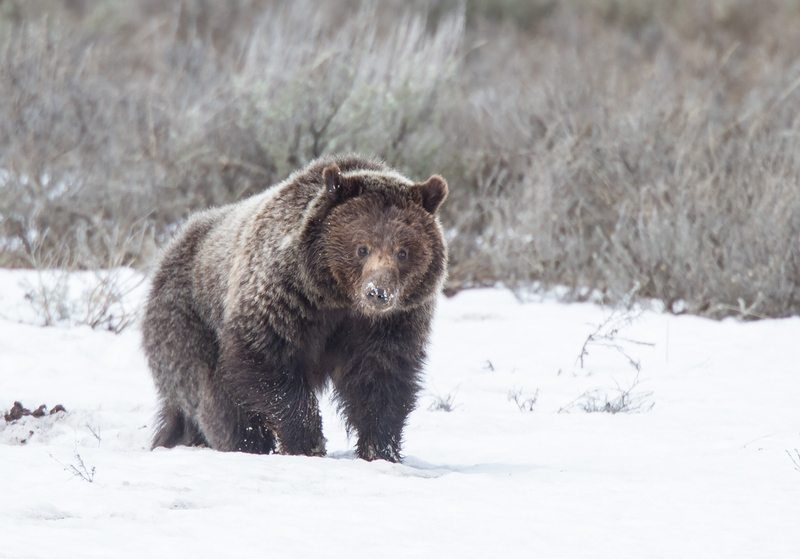 Grizzlies are omnivores, feeding on a wide range of both plants and animals. 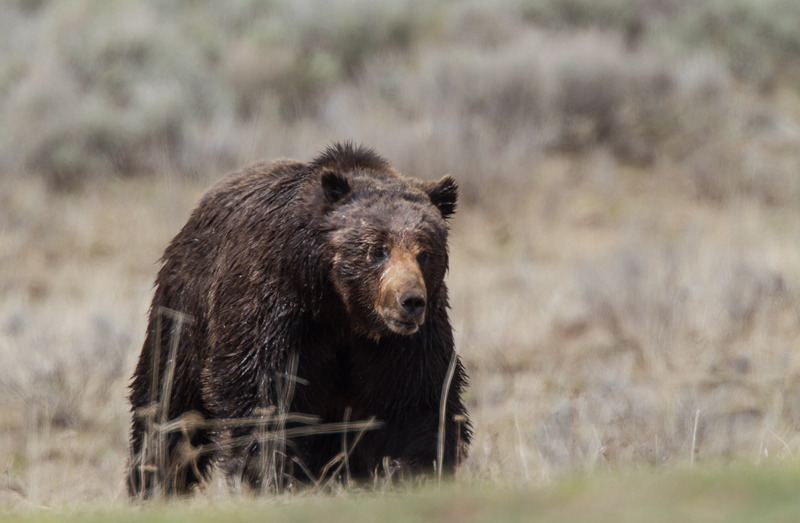 Grizzlies tend to use open areas more than Black Bears so are often seen out in meadows as they forage. Their long claws and musculature associated with the large hump over their shoulders, makes them well suited to dig plants, insects, and rodents from the soil. 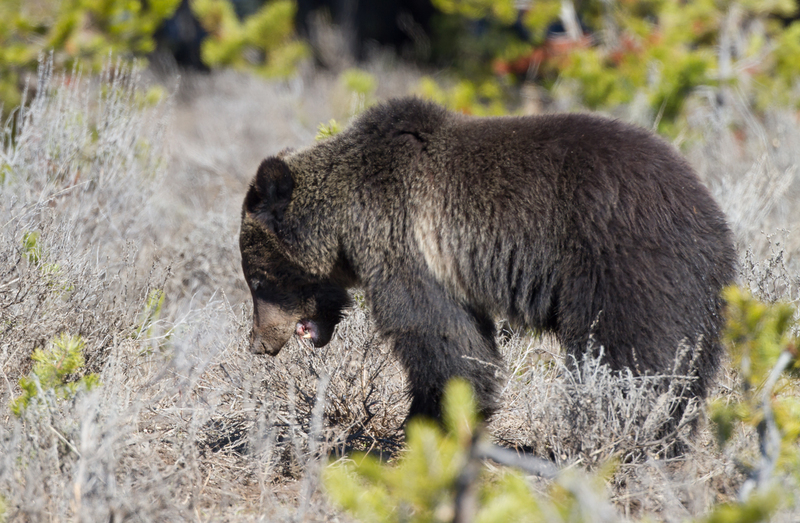 In the last post, I mentioned a Grizzly with cub seen foraging atop Junction Butte. She seemed to be digging repeatedly on a rocky slope. 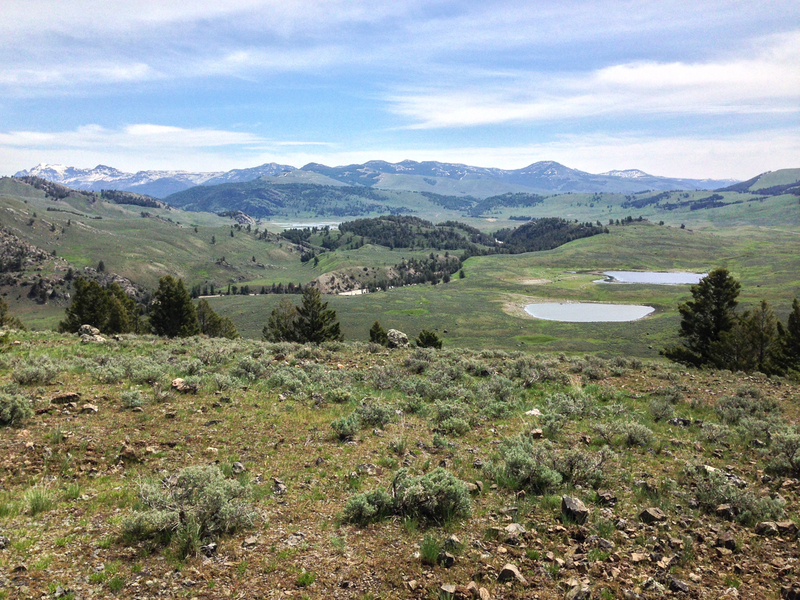 A week later, I hiked up to the top of Junction Butte (I had heard that a Grizzly and cub had been seen crossing the road away from Junction Butte so I hoped she was no longer in the area). Vegetation atop the butte is sparse and much of the area is covered by loose rock the size of a basketball or smaller. 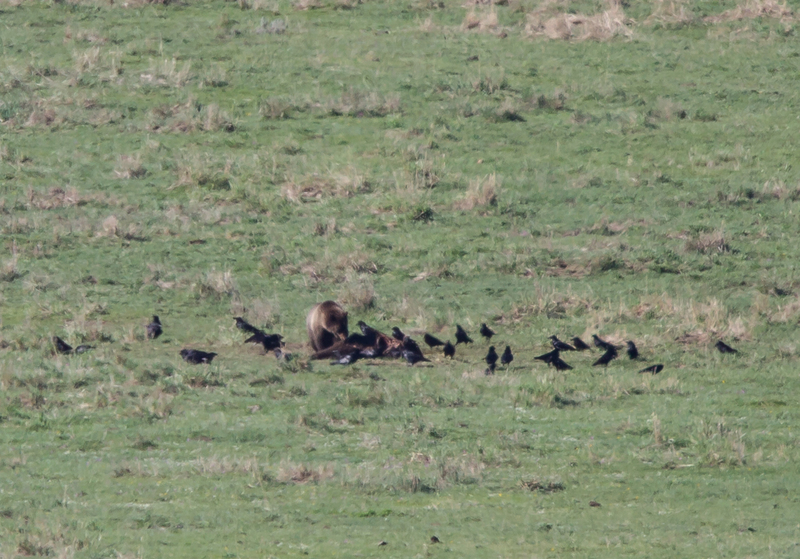 It doesn’t look like a rich feeding ground so I was puzzled as to what the Grizzly had been eating. But signs of foraging by bears were everywhere. The bear(s) had been flipping rocks, large and small. There was also some shallow digging between rocky patches. I flipped over a few rocks to see if I could find anything and saw only a few ants. I know Grizzlies are, somewhat surprisingly, fond of Army Cutworm Moths that seek shelter every summer under rocks on high elevation talus slopes. The moths migrate from the Plains up to several hundred miles away, where they feed as caterpillars, to feed on alpine flowers as adults on high slopes in Yellowstone and elsewhere in the mountains. Grizzlies have been observed eating an estimated 40,000 of these moths in a single day, so they can constitute an important dietary component. Literature suggests these massive moth aggregations occur on higher slopes than Junction Butte and are concentrated from late June to early September, so it was no surprise I found no moths. The mystery remains as to what she was digging. 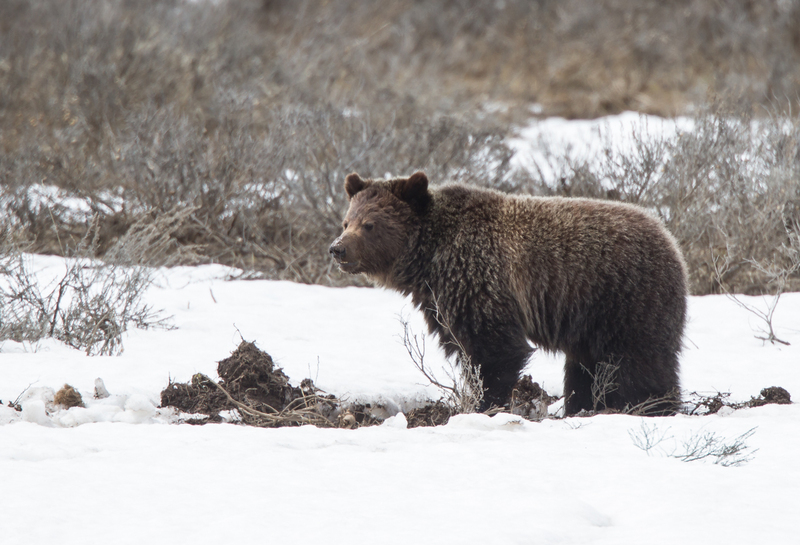 Another important dietary item for Grizzlies and Black Bears is carrion – the carcasses of Elk, Bison, and other ungulates found in the park. This is especially true in spring when bears are coming out of hibernation. Many of these carcasses are from winter-killed animals or those killed by wolves. 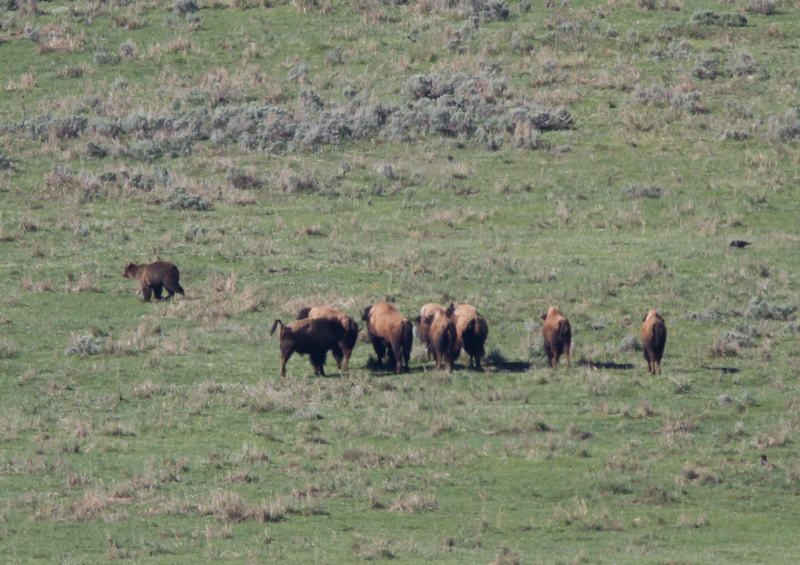 After my group arrived, we watched a Bison carcass out in Lamar Valley (there was also a Bison calf carcass nearby so maybe the cow died giving birth) as it fed various animals from Ravens to Wolves. 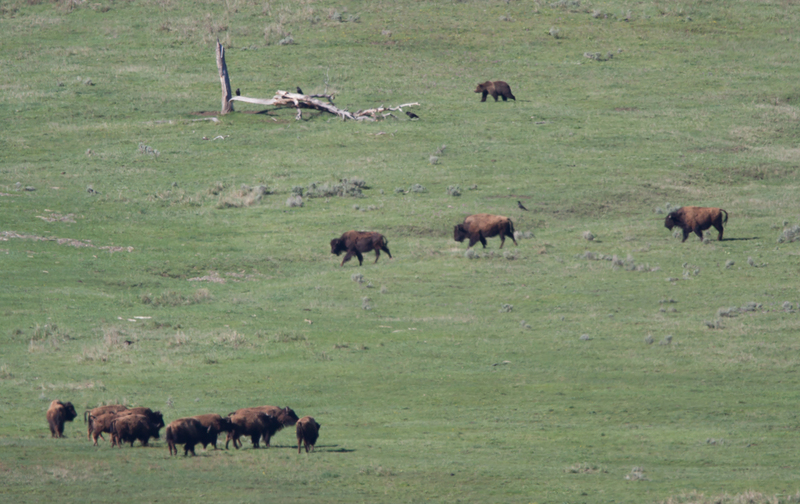 As is often the case, a herd of Bison stayed near the carcass for many hours and managed to run off a couple of Wolves that had been feeding. 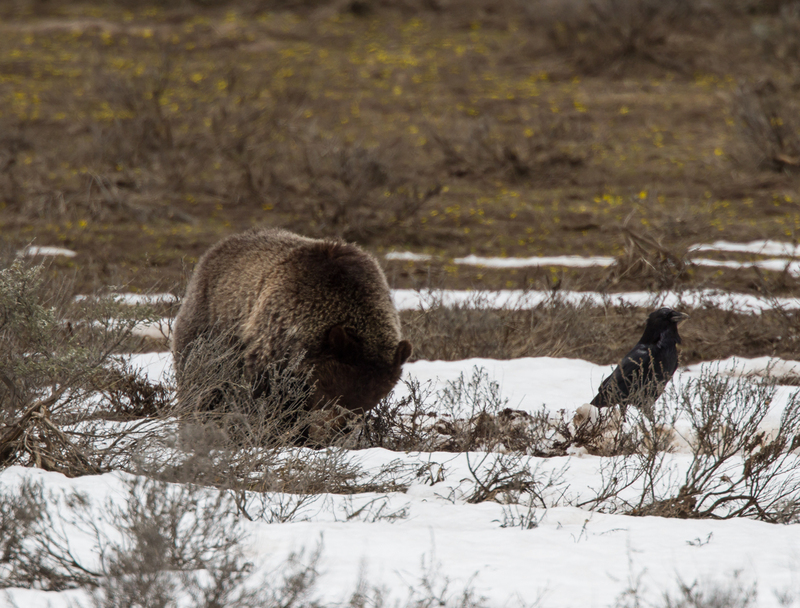 When a large Grizzly approached a little later, the Bison held their ground for awhile, but finally moved off, letting the Grizzly in to feed. 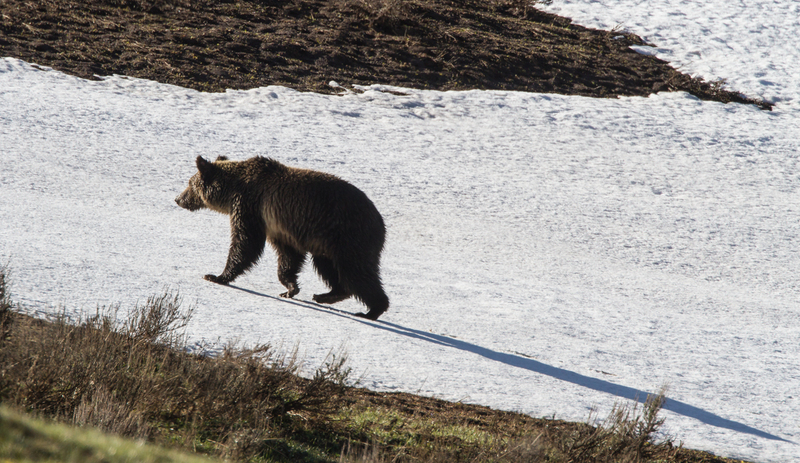 One of our last Grizzly sightings was a beautiful bear out the east entrance road near Mary Bay. Several cars had stopped to watch this bear digging in the flats near the lake. We joined the group just as the bear moved closer to the road and began to dig vigorously in one location. It moved quickly in one spot for a couple of minutes before trotting off at a brisk pace to another clearing down the road. At one point it looked as though the bear grabbed something and chomped on it but it is hard to tell from the photos. One of the participants asked if we could go out and look at what the bear had been digging. After ensuring that it had left the area, I said yes, and we all walked out to examine the area. 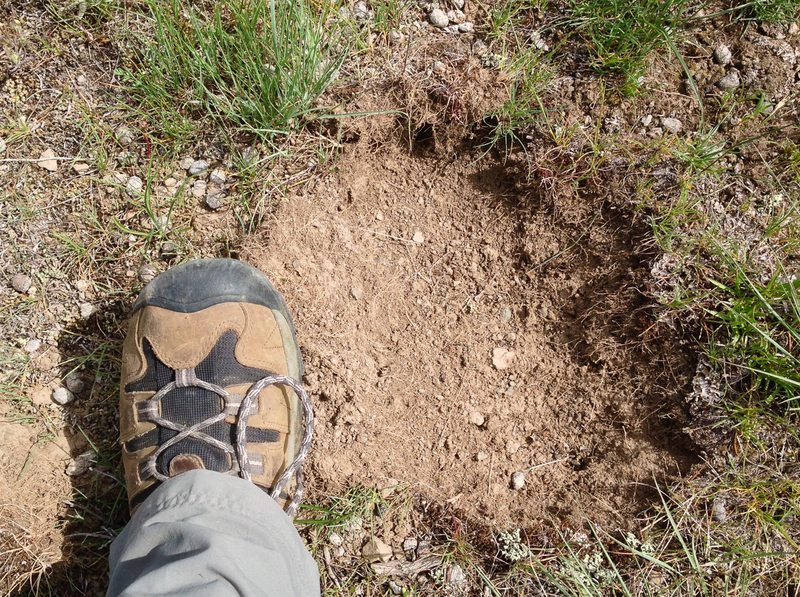 The Grizzly had dug up an area near obvious Pocket Gopher tunnels. We found these soil cores that appear after the snow melts. 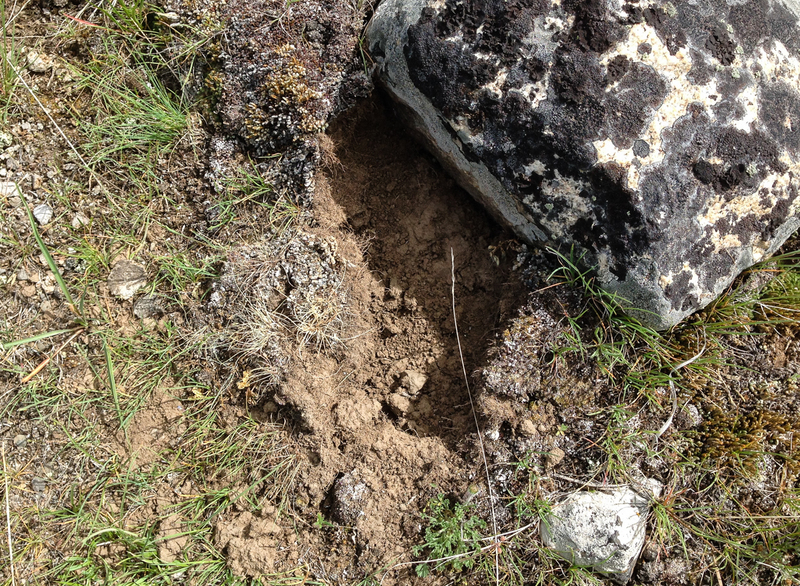 These are from where Pocket Gophers pack soil from their digging activities into tunnels in the snow. Pocket Gophers excavate huge amounts of topsoil (some estimates I have read said up to a ton of soil each year per gopher) as they search for plant roots and other foods. 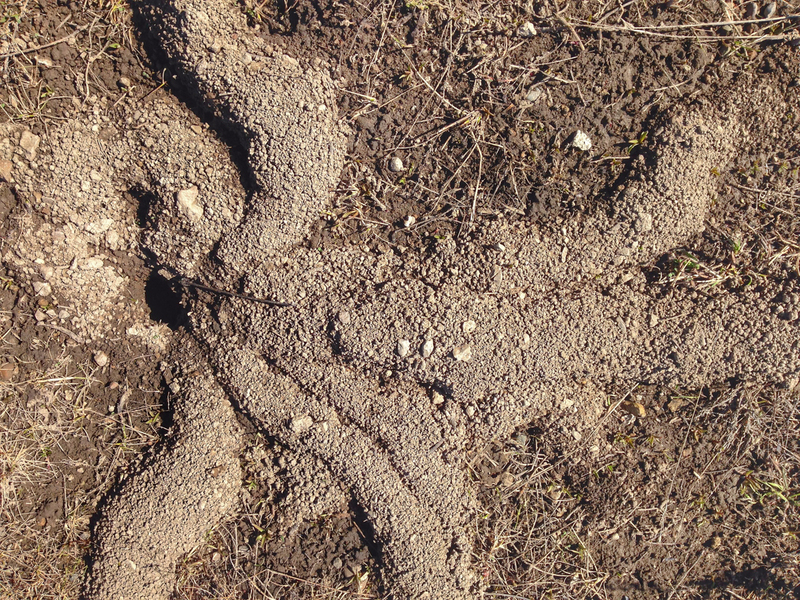 They often create a cache of plant roots in underground chambers. Bears will raid these and steal the roots if they can find them. 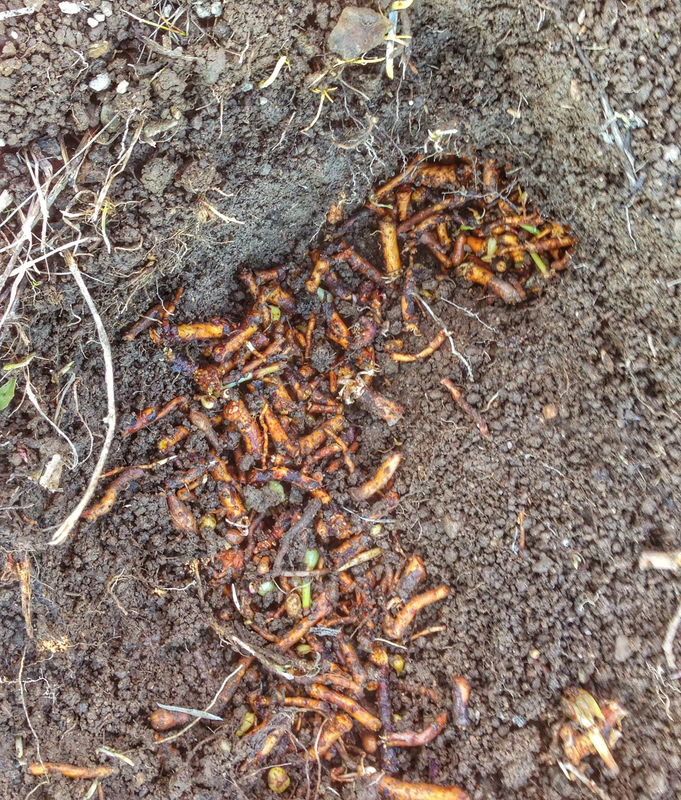 We found such a cache and what appeared to be a nest chamber (lined with fine plant material). I think the bear may have captured the gopher (and its young?) and left before consuming the stashed plant materials. 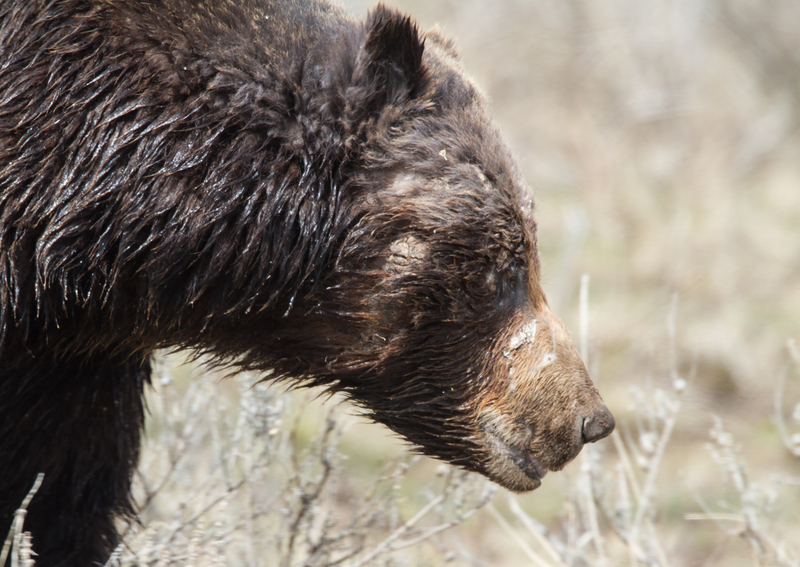 Just before leaving the area, the Grizzly paused, showing us all its mud-covered snout and efficient digging claws used to capture a meal. I can only wonder how many of these small mammals and their caches a Grizzly must have to eat to curb its appetite. 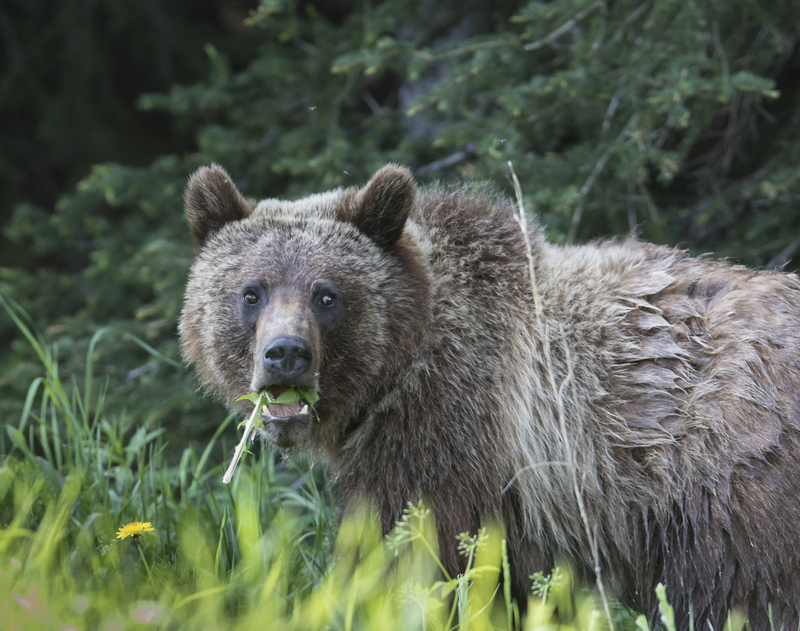 But, as the season progresses, Grizzlies will seek out additional food sources including the young of elk and other ungulates, spawning Cutthroat Trout, Whitebark Pine nuts, and many other types of vegetation. As always, it is a privilege to witness these magnificent animals as they go about their lives. NOTE: I have great respect for bears, especially Grizzly Bears. I try to hike in groups whenever possible and always carry bear spray. Park regulations require you to be 100 yards or more from bears. Photos of bears included in this blog are all taken with long telephoto lenses and are cropped. Bears keep me humble. They help me to keep the world in perspective and to understand where I fit on the spectrum of life. We need to preserve the wilderness and its monarchs for ourselves, and for the dreams of children. We should fight for these things as if our lives depended on it, because it does. Having just returned from a trip to Yellowstone, I can honestly say this was the year of the Grizzly for me. For the first time in over thirty years of travel to this incredible park, I saw more Grizzly Bears than Black Bears. 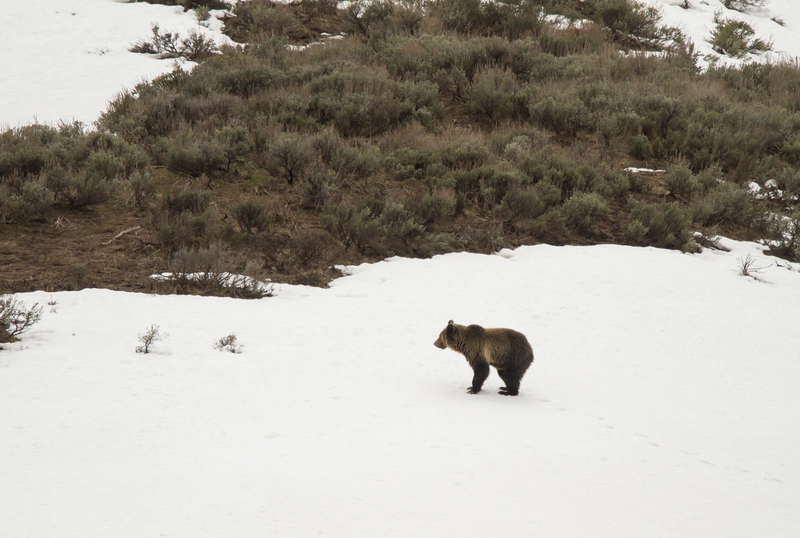 It probably has something to do with the timing of this trip – the earliest spring trip I have ever taken, and that, coupled with a late and heavy spring snow season, means many bears were still down at the lower elevations in the park. 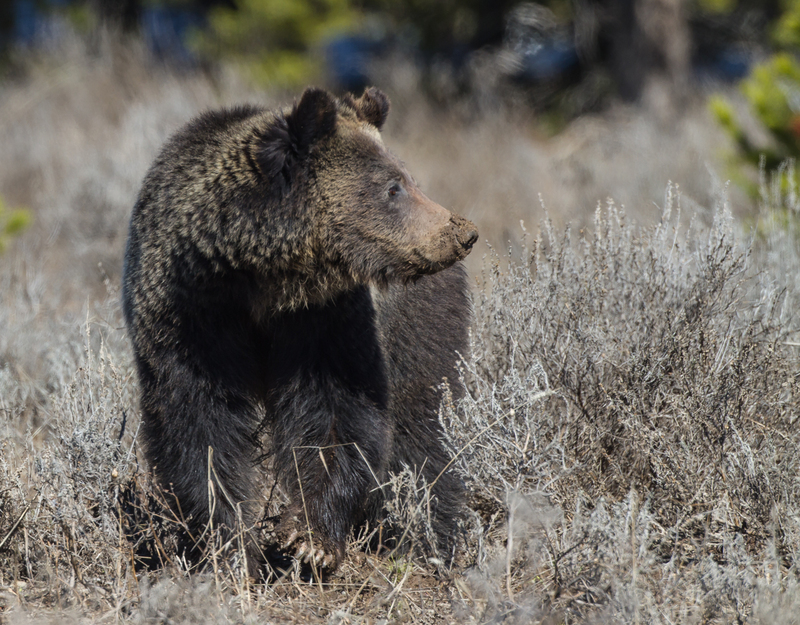 It started on the first full day in the park when a Grizzly sow and cub of the year (COY) were spotted atop Junction Butte near Tower Junction. Even through just binoculars, they were a little larger than the usual Grizzly dots seen through scopes in Lamar Valley, so it was a great way to start the trip. The sow was busy digging on the rocky slope but I could only guess what she might be after. The tiny cub stayed right up under her, so much so that it took a little while before I realized there even was a cub following her. 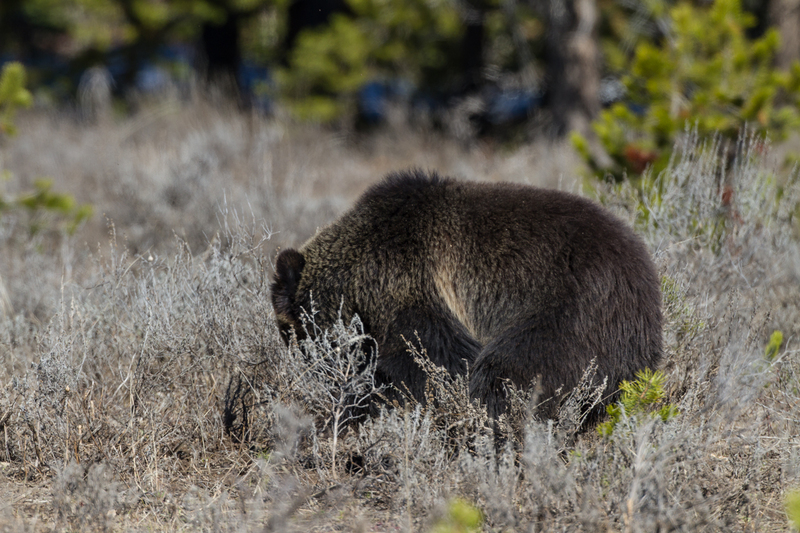 The next day, a sub-adult Grizzly was spotted near the road in Hayden Valley, digging for some unseen food. I think there might have been some carcass remains under the snow as I saw the bear pulling at something larger than any rodent out there from time to time and it remained in two small patches of snow for a considerable time before moving on. A lone Raven escorted the bear, hoping for some morsel left behind. 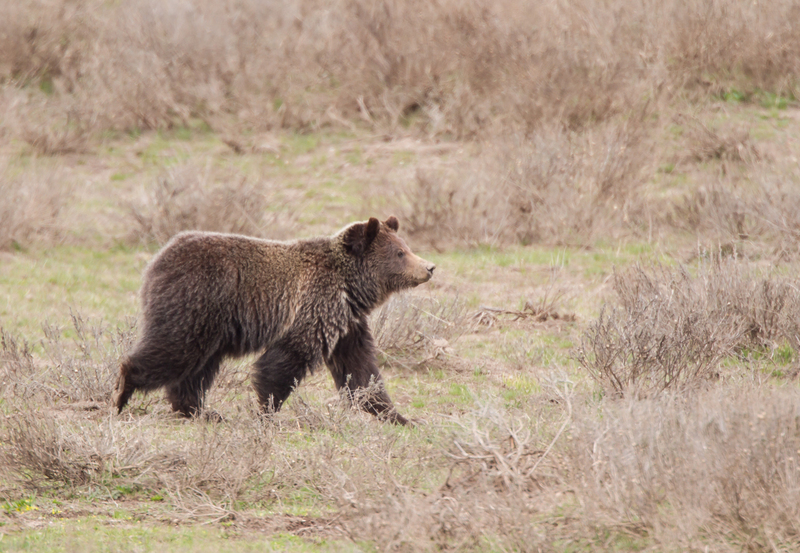 One of the viewers along the road told me this was one of two young Grizzlies that are siblings and that are now on their own (making them 3 or 4 year-olds). They have been seen feeding in this area for a couple of weeks. In fact, it wasn’t long until the sibling appeared high on the ridge, before disappearing over the crest. The bear closer to the road kept digging and pulling and would occasionally pause to look at the gathering crowd of spectators. It finally moved off, continuing to sniff and dig every now and then. Then the bear suddenly stared intently off to the right. A lone photographer had broken ranks with the crowd along the road and climbed a nearby hill. He was still beyond the required minimum distance (100 yards for bears and wolves), but by separating from the group, he had become an anomaly, and had caught the bear’s attention. The bear stopped and stood up briefly for a better view of the man on the hill, then dropped and slowly walked away, still pausing to smell and dig every now and then as it slowly passed up and over the rise. The next morning I made another run up into Hayden Valley, just in case the bears were back. There were no bears at the first spot near the road, but a half mile beyond is a wide area along Alum Creek that stretches far into the distance on the west side of the road. 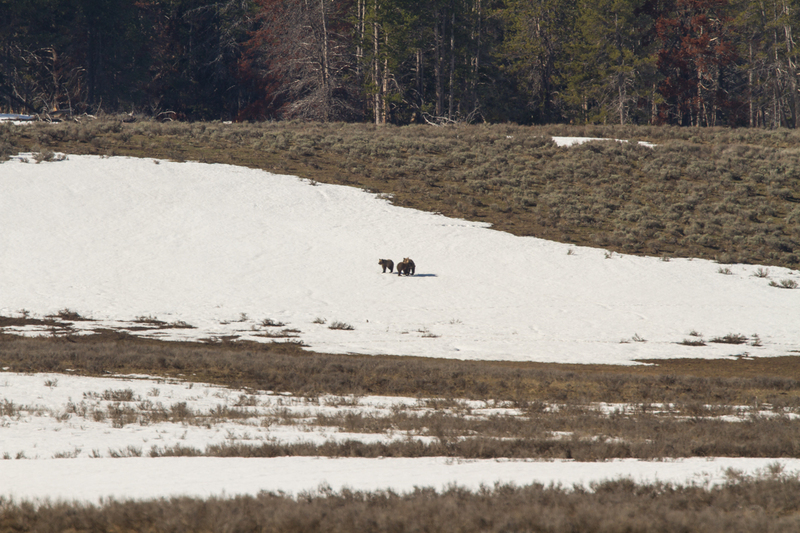 After looking a few minutes, I could see six Grizzlies from one spot, the most I have ever seen at one time in the park. The group included a family of three – a sow and two 2 year old cubs. The other three bears were solo, which is typical. All were far off in the valley, requiring a scope for a decent view. 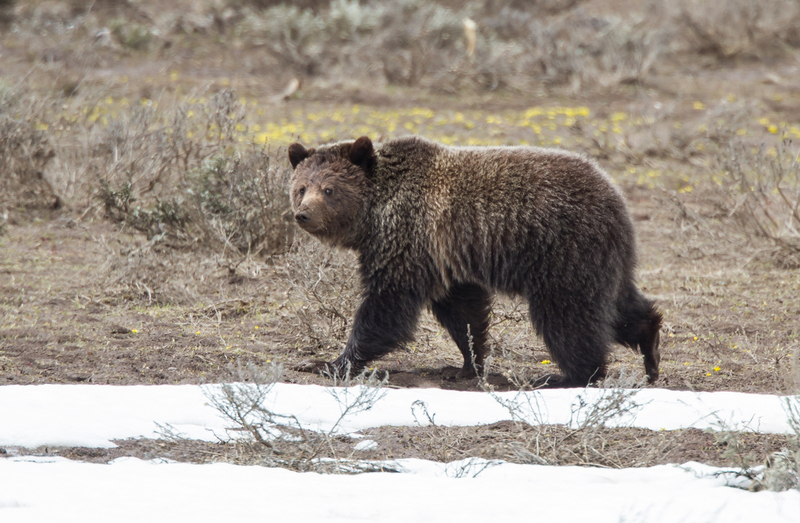 Studies have shown that Grizzly populations in the Greater Yellowstone Ecosystem (an area much larger than the the 2.2 million acres of the park) have increased from an estimated 136 in 1975 to 741 in 2013. 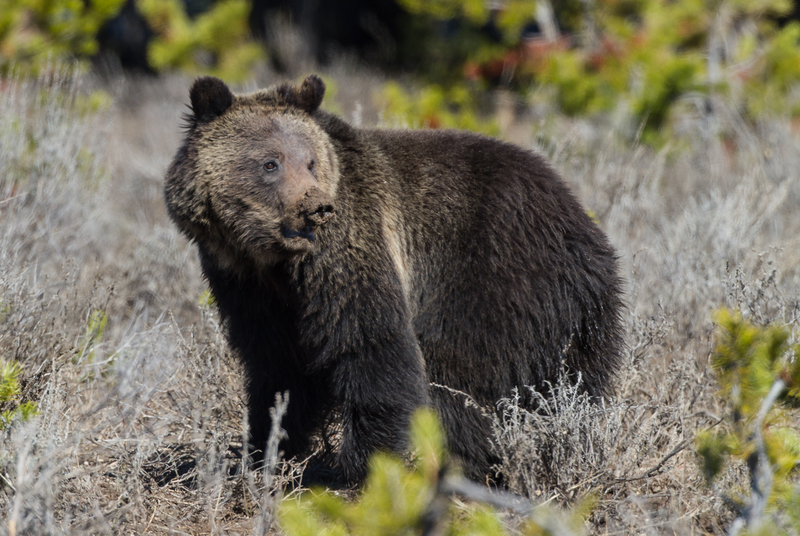 Scientists believe there are about 150 Grizzly Bears that now have at least part of their home range within the boundaries of Yellowstone National Park. After seeing a solitary Grizzly high on a snow-covered slope, the day ended in a dramatic fashion with a closer than usual encounter. A group of cars was seen at a pullout in Hayden – a bear jam in the making. A large bear had just swam across the Yellowstone River and was approaching the area where a tributary entered the river. I thought there was a chance the bear might turn and follow the stream to the road so I moved the car back up the road to the next pullout. There was one other car there. I started to walk back to the crowd but looked over and saw the bear walking at a steady pace toward my pullout. It was still a couple of hundred yards away, but I hurried back to the safety of the car, hoping the bear would cross on the ridge on the opposite side of the road at a distance of a hundred yards or so. I was wrong! 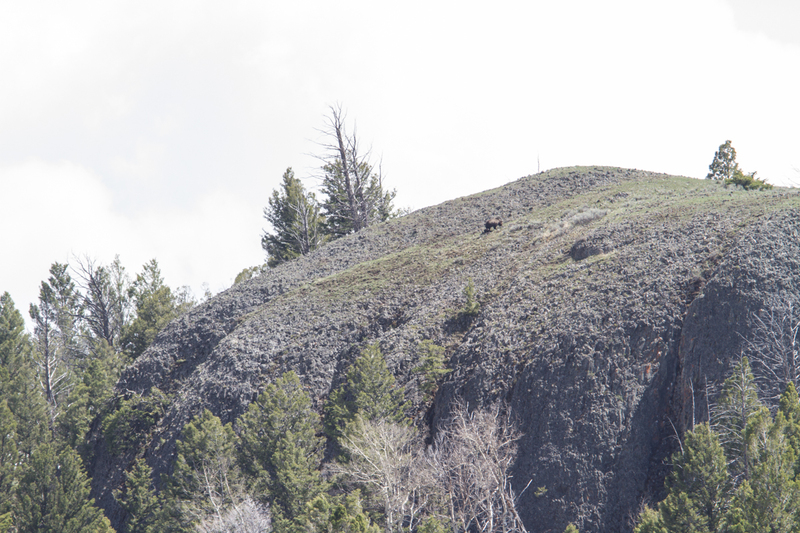 The bear suddenly popped up over the low ridge just across the road from where I had parked. One other visitor was out and I hollered at her that the bear was approaching. We both were on the other sides of our vehicles from the bear and I had thrown gear into the car and was about to get in when the bear came down to the road, turned, and ambled up the road away from us before crossing and heading down the hill. I had my 500 mm lens plus a 1.4x teleconverter, which was way too much lens for the distance, allowing only a head shot as it walked away. I could see the large bear (most likely a male) had been in a few fights and was heavily scarred on its snout and neck. I also learned that in that situation, my steadiness on the camera is very limited, so most of the images were a bit blurry. It was a dramatic moment and one that reinforced the importance of staying near (or better yet, in) my vehicle in situations like that. The old Grizzly barely even looked our way as more cars pulled into the parking area, so maybe he is used to people staring at him in his wanderings. But as he shuffled along the creek and moved off into the valley, I felt lucky to have been one those to experience his presence. 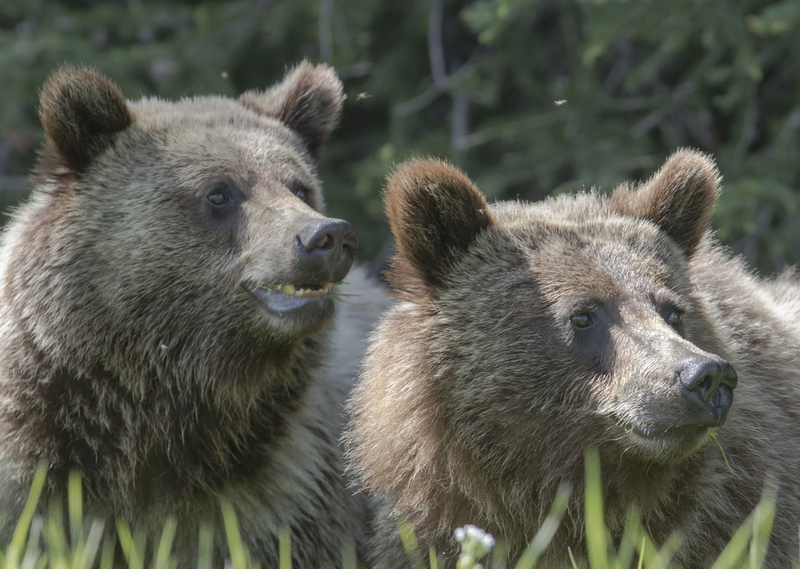 Tomorrow, more on Grizzlies and what they find to eat this time of year.